Sam and Fuzzy Extra and Holiday Deadlines! Hi friends! Two quick notes for you today. All right! Come back on Wednesday for more flashback antics. See you then! 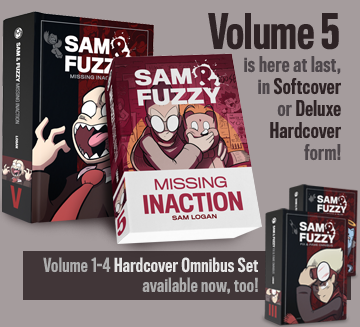 This was, I'm sorry to say, the one major continuity flub in Sam and Fuzzy history! When I came up with the idea that pre-amnesia Fuzzy had a different name (Eric), I didn't think about how it would contradict that story! Clearly, that contract has to be signed "Fuzzy", or else everyone reading it would have reacted very differently when they saw it. But since it was signed by pre-amnesia Fuzzy, it should have said Eric! To fix the flub, I introduced this relatively mild retcon, where Mr. Sin reveals that Hazel and Fuzzy used pseudonyms when they worked for him on the original Buddy Bear project (and on other sketchy endeavours). "Fuzzy" was the alias that Eric used on that job, and possibly some other ones as well. I did, I did! I'm sorry. I keep getting hijacked by other stuff! The second pinup ebook is made entirely of new material, so it wound up being a lot more work than the first one. But it's almost done. Really! If you're impatient, I've posted a bunch of preview pictures (as well as some cut/alt ones from the first book) in the Secret Art Vault, for folks backing the Patreon at the art vault level. It's that time of the year once again, team: time for seasonal shipping time advisories. 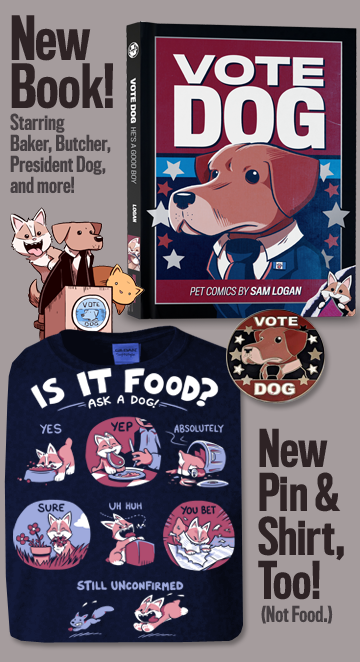 If you are looking to purchase Sam and Fuzzy swag and recieve it in time for Christmas, please make note of Topatoco's holiday ordering deadlines! You'll find them on the Topatoco site, but I've reposted them up in the top right corner of the S&F site, too. There are different deadlines for different shipping regions and (variably expensive) speeds, so if you need a timely holiday arrival, keep 'em in mind! We return on Friday with a new comic and a new round of reader Q and A. See you then!